You are here: Home / Arts & Culture / Theater / The Cirque has come to town! The Cirque has come to town! With the ongoing uncertainty of the late spring weather, theater and art aficionados, families, and the average Jane can all appreciate the mesmerizing journey of Cirque du Soleil’s latest visionary and visually stimulating show, Totem, underneath circus-like tents erected along the river in The Strip District. Totem takes its audience along for the journey and evolution of humankind, with one scene evoking the famous illustration of the evolutionary chain on Charles Darwin’s The Origin of Species, with an ape at the beginning and an upright walking man at the end. Beginning with a scene featuring an immense turtle shell, symbolic of the origins of civilizations, Cirque performers emerge and literally evolve throughout the two hour show. With acrobatics and visuals ranging from amphibians to hunter-gatherers to scientists and spacemen, Cirque du Soleil Totem is a thought-provoking look at the physical and intellectual progress of our species and our interconnection to all other beings, begging the question: Are we really so evolved afterall? In a scene featuring a science lab, a chimpanzee sits, staring and playing with a giant beaker full of light, no closer to understanding its source than are the men in the next scene in their exploration of the infinite nature of outerspace. Meaningful interpretation aside, Cirque du Soleil Totem features a bafflingly talented (and flexible!) cast of performers who flawlessly, and seemingly effortlessly, complete their acts. The stunning colors, moving set, and live band hidden in the grass pull Totem together for an all around breathtaking show that young children or the elderly alike will undoubtedly enjoy. This is a show not to be missed, Pittsburgh! 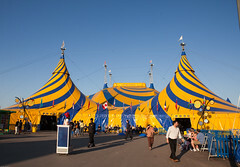 Cirque du Soleil Totem runs through June 5th at 20th Street and A.V.V.R. in The Strip District. Tickets are available here. Living Pittsburgh has a coupon code for 30% tickets here.